Impressed by McDonnell Douglas NOTAR (no tail rotor), Kamov tested scheme on experimental Ka-26 and now propose this multirole machine for pilot and four passengers. 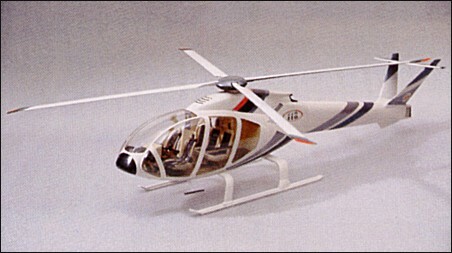 Single main rotor with swept tips, V-tail plus upper tailplane, skid gear. Engine not selected late 1993 and jet thruster design still in research. Prelim data assume single TVO-100 engine and 700 lit fuel. Looks good for a private helicopter. Wicked looking machine, shame they haven't got the funding to develop it. If it ever reaches reality then book me in to fly it!! !